1.- This is a collection of poems -"romances"- which present very different characteristics. They are similar in form: an undefined number of octosyllables, verses of eight syllables of rhyming pairs of verses, although there are variations. The oldest of these, which we are considering here, are anonymous and form what we call "Romancero Viejo" (the old Spanish ballad). Although the epoch in which the immense majority of "romances" were compiled was the 16th century, the first samples come from the 14th century, if not earlier. During the Renaissance, Spanish musicians used some of these as texts for their compositions. They consist of archaic language, frequent dialogues and a beginning or ending cut off, which produces an interrupted or fragmented feel. Their subjects and nature are very varied. An important group -possibly the oldest- belongs to the epic genre, and could have derived from fragments of epic poems set to music, which are almost totally lost today. They concerned King Rodrigo, the Infantes of Lara, the Carolingian cycle, the Cid, etc. However, lyrical "romances" about very diverse characters and situations formed another considerable part. 1600 2.- "Romances" in collections of verse and ballads have been compiled since the 16th century. One of the first is the "Cancionero General" by Hernando del Castillo, from 1511, and its later editions. 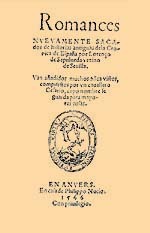 Following that are, among others the "Cancionero de Romances" (Amberes, around 1547), the "Silva de Romances", (Zaragoza, 1550-51) and the "Romancero General", of 1600, to cite some of the outstanding ones. Which are considered until now "Romancero viejo". by Hernando del Castillo 3.- The 17th century enjoyed the abundance of "romances" recuperated from earlier epochs and was quick to imitate and revitalize them. 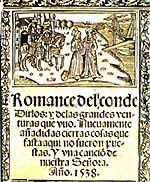 Authors like Lope de Vega, Góngora or Quevedo wrote "romances" in the old format, producing what we know today as "Romancero nuevo" (new Spanish ballads). This tradition survived, more or less stable, until the authorsof the 20th century, like Federico García Lorca or Rafael Alberti, among others.